Skiing the Alps – If you want your holiday to be nature friendly, there is a way to do it. Of course, ski resorts rely on the environment as the main draw for visitors. Protecting the environment, including the flora and fauna in the area, is essential for a sustainable future. However, there is more you can do to protect the environment and make European ski breaks a sustainable holiday type in the future. You don’t have to sell your car and never set foot on a plane again to reduce your carbon footprint. It might help, but it is pretty impractical these days with such a busy lifestyle. There are small things you can do to make changes and be mindful of your surroundings. If you want to change the impact your travels have on the environment, look at these things you can do yourself to reduce your carbon footprint. When booking your trip, think about how you will travel to your destination. Air travel damages our environment. By driving or even better, taking the train, you minimize your carbon footprint as opposed to flying. Your holiday starts with the beginning of your journey. Driving or taking the train can be a fun way to see other places on the way to your destination and is a great way to see surrounding areas as you get to your resort. If you do need to fly due to time or cost, think about offsetting the carbon footprint of your flight. If you care about the environment, you probably already recycle at home. It is easier than you think, even when you are on holiday. Many environment conscious resorts offer in-house recycling. They can be very accommodating to visitors with an environmentally-friendly mindset. Some very green resorts make recycling a requirement to help keep their resort as eco-friendly, clean and enjoyable as possible. That which cannot be recycled must be disposed of appropriately. You must think about the environment and keeping both inside and outside the resort rubbish-free. Cigarette ends are a particular problem as people often discard them in the mountainside without a second thought. Thinking about how your presence impacts the environment. When you follow the rule of leaving the place better than you found it, you are on the right track. If you can, leave your car behind when you are in the resort. If you stay in a central location, you can always walk to where you need to get to. For places further away try to take local transport such as shuttle buses which many ski resorts provide for free. Or you could take advantage of other modes of transport such as renting a bike. It’s great for your health as well as the environment. Carbon offsetting is an internationally recognized way to take responsibility for carbon emissions that are unavoidable. You essentially pay for the equivalent carbon dioxide saving elsewhere. Not only will you be reducing your carbon footprint, but the companies who provide these services also improve biodiversity, food security and health and well-being in developing countries. In the Alps, you should look for tour operators with an AITO recognized environmental policy. These companies adhere to strict guidelines to reduce their impact on the environment. Which are the greenest alpine ski resorts? Here are a few of the most notable resorts in the Alps to ski green. These are known for their sustainable energy efforts and environmentally friendly policies. This resort has its own climate and energy action plan. They have been awarded the Flocon Vert or the green snowflake. This is an award to raise awareness for more sustainable resorts. Famous for being car-free, Saas Fee has been awarded ‘Energy Town’ status. They are working their way toward being carbon neutral. With no purpose-built slopes, the biggest energy uses here are the operating of lifts and gondolas. The resort uses renewable energy to operate all systems, including solar power. When you plan a ski holiday on the Alps, look for an eco-friendly ski resort where they care about their carbon footprint. These resorts actively reduce their impact on the local environment. Here are a few things resorts are doing to protect and preserve the environment. Instead of all-inclusive stays, resorts who are looking after their environment encourage visitors to eat and drink in local restaurants and bars. By spending time and money in local establishments, tourists help the local economy and sustaining efforts for resorts to become and stay more environmentally friendly. Some companies and brands are adopting an eco-responsible attitude to their production methods and reducing their CO2 emissions. This includes the replacement of toxic substances like fiberglass with bamboo. There is also a recycling scheme for old skis and snowboards. Using eco-friendly board and ski wax is also a way to prevent damage to the local environment. The Alps are getting better at using green power to fuel the growing resorts. Many want to have as little impact on the local environment as possible. Governments are offering incentives to companies who use or set up green power for their resorts. This can be a real boost as some start-ups can be expensive. Putting these methods in place are just a few ways these resorts are turning up the green power and reducing their carbon footprint. Some ski resorts such as Zermatt have banned cars altogether. Instead, they provide an efficient train service up to the resort and electric taxis to transport you around the town. Morzine has created no traffic zones. Meribel and La Plagne provide free shuttle services between ski areas encouraging people to leave their cars behind. Car-free resorts are popular with visitors, especially families. Not only is it better for the environment and reducing air pollution, it offers a safer environment for kids and the overall atmosphere of the resort. Sustainable travel will make a big difference. How you take your holidays has an impact on the environment. As you can see, although climate change is a real risk to our planet, there are many things you and the wider community can do to help reduce adding to the problem. Things are changing all the time. Companies continue to come up with innovative ideas for us to be more environmentally mindful. 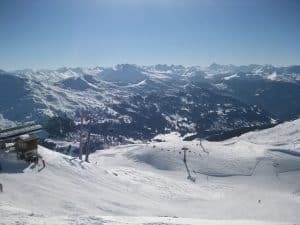 So, you can still enjoy your ski holiday, safe in the knowledge that you are travelling environmentally friendly and reducing your carbon footprint. Ski Green – As you most likely have experienced and read about, the weather and climate changes in recent years have had a profound effect on our planet. And with increasing temperatures in even far-north regions of the world, ski resort owners, especially the mountains at lower elevations, are among those hit hardest by global warming. The next time you want to ski, think about ways in which you can ski green. All across the country, ski resorts are experiencing the effects of climate change. Many are taking proactive measures to prevent and lessen the impact. Just like on other vacations and quick-getaways, you can make a few eco-friendly changes which will have a big impact in the area you ski. Before you even get to the chairlift, you have a chance to make a positive choice to ski green. Where did you choose to ski? How did you get to the mountain? Here are some points to consider to be more environmentally-friendly. Take a day trip or fun weekend getaway to a nearby resort instead of flying to a farther destination. You can even pack a cooler and enjoy your own food, drinks and snacks. 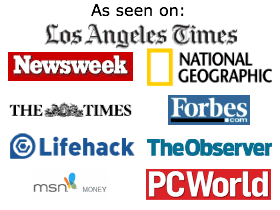 Ask friends, family and coworkers who may share your interest and go together. Investigate whether the resort you are staying at offers a shuttle to and from the airport, and save on renting a car. Many areas offer weekend day trip transportation for teenagers; special trips for families or seniors; and rides for tweens and teenagers to head to the local mountain for the day. Another way to ski green is going to a greener ski resort. So many resorts are becoming more and more aware of their impact. Ask questions before you make a reservation. This not only allows you to make a greener choice, they realize their efforts or non-efforts to be more earth-friendly, really do matter. Are their trail maps and resort guides printed on recycled paper? In their rooms and restaurants, do they have a water conservation program? Are their cleaning products environmentally friendly? Do they use porcelain and glass rather than disposable paper and polystyrene products? Is the food they serve local? Do they harness wind power for their energy needs? Do they use renewable energy to power their chairlifts? Do their machines to clear the trails run on bio-diesel? Do they offer a shuttle service to and from the airport? While you are a patron of the ski resort, remember to compliment them, especially the manager, on their efforts and encourage them to continue to operate more sustainably. Remind them that what they do does matter. Ski areas that work to reduce their CO2 emissions also save money! Another idea is to take up cross-country skiing. It can be done in many more “local” places, and depending on the snowfall where you live, maybe even very close to your own home at a park, trail, or even in the street. Cross-country skiing burns fewer resources overall — no chairlifts for one. Added bonus: It burns more calories than downhill skiing. You are skiing in someone’s backyard. Remember to respect all wildlife. Don’t feed or attempt to interact with the wildlife. If you love skiing and want to decrease your carbon footprint, think about using some of these ways to ski green. Being more aware of our impact doesn’t mean giving up the activities you enjoy doing. It is just about seeking out ways to do them better. It is very easy to ski green once you start considering the many possibilities. Top 10 Green Ski Resorts in the U.S.
Green Ski Resorts – Taking a ski vacation is a wonderful way to have fun. It can also have a big environmental impact if you’re not careful. There are steps anyone can take to ski green. The way to have the biggest impact is to visit an eco-friendly ski resort. Our list of top 10 green ski resorts in the U.S. is compiled using data from firsthand experience, employee policies, and information from Ski Area Citizens. Squaw Valley is consistently near the top of every eco-friendly ski resort list. It’s no surprise. The resort performs above and beyond in the area of habitat protection. They manage to improve their ski terrain without encroaching upon new areas. This protects species and their habitats. On the practical side, Squaw based in a village. This reduces commuters and favors guests walking to and busing to lifts. As one of four mountains owed by Aspen Skiing Company, Aspen Mountain scores highly on all lists for water conservation efforts and water quality. The ASC was one of the first ski corporations to turn to wind power, now offsetting 100% of its electricity. Sugar Bowl is a founding member of the Sierra Green Building Association. Their mission is to promote environmental design in the community. The Sugar Bowl team is also pursuing long-term restoration of natural surroundings and habitats. As Sugar Bowl was my favorite ski resort growing up in Lake Tahoe, I’m heartened to see they’re committed to preserving the beauty of the natural landscape. Sundance received full marks for habitat protection by Ski Area Citizens. They are committed to renewable wind energy. Even better for guests: Sundance offers access to a full-time naturalist on site. In winter, they conduct their Sundance Ski Ecology program, which includes a guided nature and ecological tour of the mountain. 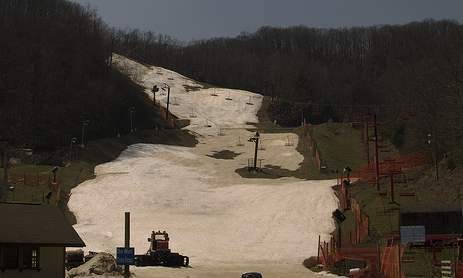 Jiminy Peak is a small resort making big changes. Because lower-elevation resorts such as Jiminy risk losing snowpack more quickly because of global warming, they installed a wind turbine to contribute power. Affectionately called “Zephyr,” the turbine powers over 30% of Jiminy Peak’s needs. Skiers and snowboarders can even tour Zephyr and learn more on-site. I love that my ‘home’ resort of Mt. Bachelor recently hired climatologists to conduct environmental studies on the mountain. Their goal is to establish a long-term plan for reducing the resort’s carbon footprint. The same team is analyzing waste and recycling efforts. Management has already swapped transitional fuel for recycled cooking oil bio-fuel, green cleaners for housekeeping purposes, and recycled paper for warm-beverage cups. Northstar sets itself apart in eco-friendliness by snagging the WRAP Award (the State of California’s Waste Reduction Awards Program) for the past thirteen years. Additionally, Northstar donates wood pallets to a local firewood distributor for reuse as firewood. So far, they have diverted 255 tons of material from landfills. LEED certification was recently awarded for the new Zephyr Lodge. The Village at Northstar was the first LEED certified village. Alpine Meadows, owned in conjunction with eco-friendly Squaw Valley, consistently performs well in habitat protection. They urge their employees to use public transit (and pays for it). A perfect example of large resorts successfully reducing their carbon footprint, I love that Alpine guests won’t sacrifice anything in convenience or comfort while still enjoying a green vacation. Park City joins Alpine Meadows in stellar habitat protection. They performed well across the board on habitat protection, from maintaining undisturbed land to water quality conservation. On the small measures side, Park City has recently invested in more efficient lighting and fuel, conducting what it calls an ‘energy audit’ on the entire mountain. Their website credits this audit with reducing their carbon footprint by 15,000 tons. People know Vermont for its eco-friendly lodges and resorts. It’s no surprise that Smuggler’s Notch (or Smuggs, as it’s affectionately called) makes this list. The resort’s green initiatives include wildlife and habitat protection, energy efficiency, and recycling. Smuggs strives to teach as well as do. Because Smuggs places an emphasis on family fun and children, they structure their day care and ski school curriculum around environmental themes. Even their ski school mascot is known as “Mother Nature,” serving as an eco-friendly teacher on the hill. We go skiing to have fun, be outdoors and to gather with friends. When you choose to ski green, you will enjoy natural environment, see stunning terrain, and have a great time with companions. If you like this post, be sure to read Best Ski Resorts in the US with Kid-Friendly Activities and Ski Vacation Costs: Where to Splurge and Where to Save. Ski vacation on a budget – A vacation at a mountain ski resort can equate to serious fun in the outdoors… and a serious investment. You’ll be spending money — there’s no way around it. So before planning your next adventure, learn ways to plan your ski vacation on a budget. You’ll learn which amenities and activities provide the best value and which can be skipped altogether. Below are the top values for and ways to save on your next ski vacation on a budget. With some types of travel, your choice of lodging is nothing more than a place to lay your head at night. But where you stay at a mountain ski resort matters greatly and can impact your entire trip. Not only will you spend a significant amount of time enjoying your accommodations, you’ll also traverse back and forth to the lifts several times every day. Location is key. Paying more to stay slope-side with ski-in, ski-out convenience will save you time and effort, increasing your enjoyment and vacation value. Likewise, choosing a condo or vacation home rental with a kitchen (and ideally, laundry facilities) will save money on dining. You will be minimizing your impact on the environment too by eating in and not driving to the slopes. I’m going to take a radical stance: if you plan to include ski lessons in your vacation, go private. At first glance, opting for private lessons seems like an extreme indulgence. That’s certainly what I thought before experiencing them firsthand at California’s Northstar-at-Tahoe. In truth, private lessons come with built-in value. You will receive individualized attention (during which you or your kids will learn far more than is possible in cheaper group lessons). Individual lessons also provide ski school line access which is a huge value on crowded days. Additionally, you will enjoy a personalized tour of unfamiliar ski terrain. During our lesson at Northstar, our instructor was able to tailor our lesson to the type of terrain we were most interested in, playing tour guide for the mountain resort. On our own, we wouldn’t have discovered half of this large mountain! What’s more, most private lesson packages are generally for up to four to six people for one price. Our private half-day lesson for our family of five added up to less than it would have cost for my husband and me to put our three kids in all-day group lessons, and we were able to spend more time together as a family. Most ski resort lodges have very good grub — or is it just easy to work up an appetite? Unfortunately, food on-mountain is also notoriously expensive. Because lunch for a family of four in a typical ski lodge counter-service restaurant can cost between $60-80 per day (we expect to pay upwards of $100 for our family of five), we opt to eat breakfast and dinner in our condo or vacation home. Not only is it more convenient to purchase food on the mountain at mid-day than pack it in (renting a locker to store your lunch can set you back $10 per rental and lots of lost time), but we’re downright worn out after a day on the slopes, and more than happy to whip up something easy for the dinner meal in the comfort of our condo après ski. If you want to bring that lunch cost down as well, bring bladder-style water bottles and fill them up at drinking fountains. Skipping purchased drinks can save a family as much as $8-10 per meal. After lodging, lift tickets will likely eat up the biggest chunk of your vacation budget. There are, however, ways to save. And there are exceptions to the heart-attack-inducing pricing. Most resorts offer reduced prices if tickets are bought online, and nearly all offer multi-day discounts. Never, ever buy one-day tickets at the window the day of, if possible. Check for resorts, like Oregon’s Mt. Bachelor, that offer pricing on a sliding scale, calculated by how much of the mountain is open on a given day. If you plan to ski more than five days, or plan to return at least once in the season, look closely at season pass options. Our local resort of Mt. Ashland, Oregon offers an unbeatable deal for spring skiers: buy a season pass for the following year, and you ski free throughout the current spring season! Lastly, look at lodging-ticket combo packages, especially if you plan to rent equipment and buy lessons. Smuggler’s Notch of Vermont does this better than any resort I’ve experienced. Their ski-lesson-lodging-activity packages for families cannot be beat. Warning: the following may be another unpopular opinion. Tubing at most ski resorts is not a good value. While the activity is fun — and provides non-skiers with a great way to spend time in the snow — tubing tickets are almost always overpriced. We were charged $30 per hour, per person at a major ski resort recently. Instead, a small amount of research will almost always reveal a local (free or cheap) alternative. Check for area snow parks where you can cross-country ski or snowshoe for the cost of daily rentals, or ask lift operators or waiters where the best sledding is found. It is possible to have a memorable ski vacation on a budget. Just follow these tips on where to save and where to splurge, and you will have a great ski trip without breaking the bank. Where do you splurge and save on your ski vacations? Summer Vacation at a Ski Resort – Surprised? Don’t be! Ski resorts are located in some of the world’s most beautiful natural settings, are built to accommodate visitors, and have just as much to offer during summer travel as when the snow falls. While everyone else is booking beach resort and theme park summer stays, ski resorts sit relatively empty, ready for families, adventure travelers, and outdoors enthusiasts. Below, read four reasons to book a ski resort vacation this summer, with best summer ski resort picks included! Obviously, ski resorts are located in mountainous settings, but often, they lie adjacent to national parks and other popular summer recreational areas as well, making them ideal base camps for hiking and touring. During the summer months, when national park accommodations sell out, nearby ski resorts often sit half-empty, ready for families and individual travelers to spread out in spacious condos or ski cabins. Kids can play in the forests right outside the front door. Families can book river rafting trips, fishing expeditions, and bike riding, most of which can be arranged by the ski resort. Many resorts now provide ski resort summer activities staff who can help you plan your summer ski resort vacation. Spend a day or two in the national park, then exit to spend your evenings in relative quiet. If you’re planning a backpacking trip, the extra space at a ski resort can be invaluable for packing and sorting supplies, preparing backpacking food, and doing laundry. Favorite ski resort near a national park: Big Sky, Montana, adjacent to Yellowstone National Park. Off-season equates to lower lodging rates, pure and simple. Though not the secret that it once was, summer ski resort stays are still very affordable, with room and condo rates an average of 30% lower than in the winter season. Most resorts try to entice travelers with package deals on top of this, bundling activities and meals with overnights. Smuggler’s Notch, Vermont, which bundles accommodations in their village with kids’ camp and child care tuition, swimming pool passes, and activities. During the summer months, visitors can literally walk through ski resort villages in the morning (bustling with people just months before) and not encounter another soul. For the ultimate in solitude, plan a fall visit to your favorite resort: there’s a good chance you’ll encounter only deer and rabbits. The only downside: some shops and restaurants are seasonal — and summer is not their season of choice. Visitors may be restricted to a handful of dining and shopping options. Luckily, it’s easy to bring groceries to ski resort condos and cabins and cook food in-house. While Keystone offers plenty of summer activities, its location far removed from a major city makes it naturally quieter. In an effort to draw summer visitors, ski resorts have (wisely) capitalized on all their ready-made terrain and outdoor spaces have to offer. Our favorites offer downhill mountain biking, hiking, zip lines, swimming in both pools and lakes, river rafting, and horseback riding. Summer visitors can easily play outside from morning to night and not run out of things to do. And if you encounter a rare rainy day, most resorts are ready with movie theaters, museums, and shopping. Northstar-at-Tahoe, California, which sets visitors up with an entire “base camp” of activity choices daily. And if you can’t commit to an entire summer ski resort vacation, keep them in mind for road trip pit stops. Many resorts are perfect for day trips. We love Bousquet Mountain in Massachusetts for their award-winning Frisbee golf course and high ropes course, and Squaw Valley, CA for its aerial tram to its summit swimming pool. Have you enjoyed a summer vacation at a ski resort? What resort is tops in your book for summertime activities? 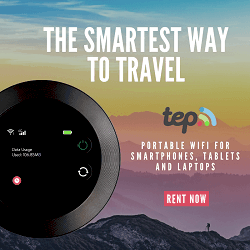 How do I get Internet While Traveling?